Let me tell you something about teenagers; they will do exactly the opposite of what you want them to do. They’re like cats. Or really clever toddlers. So I guess the idea is to trick them into thinking you want one thing, when in fact, you desire the opposite. Trouble is, teens don’t fall for this ruse. Especially when it comes to food. They know your eating philosophy all too well. And no matter what end of the spectrum you’re on, they’ll run to the opposite. In fact, the more you insist on healthy, home-cooked meals, the more vile their taste for crap food becomes. Especially when all of their friends are eating it. I remind myself that I grew up on the worst the processed food industry had to offer in the ’70s. Pop Tarts, iceberg lettuce, minute-rice in bags and frozen dinners galore. I eventually came around. But perhaps in coming around, my disdain for the sort of crap I ate as a kid has become too dogmatic. Maybe I lectured a little too long and a little too loudly about the virtues of buying strawberries in season, or why Lunchables will kill you with nitrates, or why one must never bother with mashed potatoes out of a box. The Drama Teen is bound by the rules of her age to rebel against the rules of my kitchen. Hence her thing for Chef Boyardee. I bought two cans of the meat ravioli for her the other day, just to see how we’d both react. I recall feeling shame at buying them. I prayed I wouldn’t run into any of my mom friends. How would I explain myself? And so the Drama Teen makes herself a bowl of Chef Boyardee ravioli every now and then and I make myself say something nice or say nothing at all. I’m gonna trust that some of my food dogma will stick to her eventually. Was I ever really likely to make homemade meat raviolis for her anyway? No. And to her credit, I’m told she’s never actually had a Ding Dong. Impressive. Because I ate a box of those every week, too. 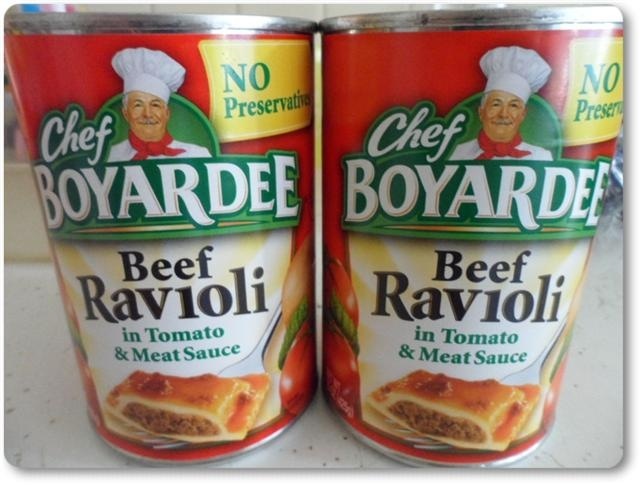 Every now and then we all crave somthing from our childhood and Chef Boyardee’s beef ravioli (not the minis, not the cheese raviolis, not the beefaroni (blech), nor the “lasagna”) fits the bill for me. Yeah, it’s loaded with sodium and cholesterol and has a slight metallic taste. But in the world of pre-fabbed food it’s not the worst choice nutrionally, takes little effort to chew, and I’m pretty sure the shelf life is indefinite. They’re best with the “cheese” in the green can. But I beg you…please don’t tell us from what part of the beef they;re made of. Hmm, I’ve never had Chef B anything but I have a serious weakness for Chinese ramen packages, which I imagine are way worse nutritionally than Chef B even if you try to tart it up with an egg and veggies. Ha! 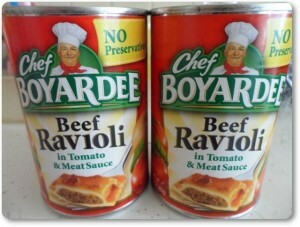 I loved Chef Boyardee!! There’s really nothing like that sauce…not sure if that’s good or bad? I grew up on Spaghetti-O’s, remember that sound they made when they came out of the can? Thanks for the nostalgia!